Corns and calluses develop on the skin as a result of repeated friction to your feet. “Corns typically develop on the tops and sides of the toes, and on the balls of the feet, and common causes are arthritis or poorly fitting shoes,” according to Dr. Nada Elbuluk, assistant professor of dermatology at NYU Langone Medical Center in New York City. 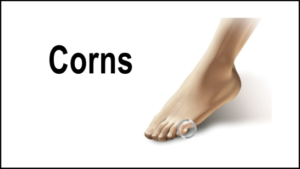 Treating your corns involve soaking them in warm water for up to 10 minutes, using a pumice stone to gently file the area, and applying lotion that has salicylic acid, ammonium lactate, or urea. Avoid shoes that are too tight for your feet and add pressure onto your toes. For help dealing with corns and foot conditions, consult with one of our podiatrists from Foot HealthCare Associates. Our doctors will provide quality care for your feet. Managing Corns: What are they? And how do you get rid of them?